It's hot again and that just makes me want to do nothing but whine sew and sit in front of the fan. Gosh, that seems to sum up the whole summer of 2010. But I did make some progress on this and almost have it ready to share with you. Hoping that I can do that very soon. Maggie and Mo take Grammy out to lunch every Saturday. Sometimes I tag along, but they have a different kind of fun when I don't. For a few hours, in between other weekend to-do's, my friend, Lynne met me at the river. She handed me a good book (see edit below), a comfy chair and an August afternoon escape. Lest you think I'm always at the river, hardly ever in the studio, I'll be back soon with something to share. edit: This looks like a recommendation to read this book. For that first afternoon, I enjoyed the opening chapters, but by the middle, then the end of it today, I was so disappointed. And it wasn't even the depressing message. It was the insulting absurdity of the plot and the poorly rendered characters themselves. Enticing cover though. The designer did a great job on that. Thanks for the kind notes about Maggie and James. We had a little celebration with them the other night, all family and friends getting together to toast their happiness. Lots of love. Hard to believe that here we are at the last summer Friday of August. And wouldn't you know it, the weather finally feels like the gentle summer we wished for through all those scorching hot or stormy days. It's a wonderful time of year. September seems like the beginning of so much! Edit: As I was finishing this up, Mo called to say she was on a fire call at the Irvington train station for a suspicious package on the tracks (directly adjacent to the park). Train service to and from Manhattan has been suspended and the bomb squad was dispatched to blow it up. Because traffic through town was diverted, a truck got stuck in the little one-way tunnel exiting town on the only other road. It's all resolved now, but our sleepy little Mayberry had a very exciting morning! Everyone back to work. August resumes. Edit #2: If you go to the local news link above, be sure to read the reader comments. Awesome! We are so, so happy for them, for our lovely girl, for James- and for our whole family who loves him too! Thanks for all the sampler love! I'm filling the hoop with this practice piece today and taking it to the doctor's visit with Mom. They make you wait long enough that I could probably finish the whole thing. On days like this, you have to try to make the lost moments matter somehow. One way or another, they often add up to something unexpected, something memorable. I'll keep you posted on how it goes. Loving it so far. Seemed like a good day to show you what you can do with your finished sampler. I decided to add it to a canvas market tote because it's so easy to do. Started with a blank tote already here. The linen won because it's beautiful, neutral, doesn't compete and adds sophistication rather than more sweetness. I was planning to paint the bag with a potato print but decided against that. Less is more this time. Sewed the embroidered piece to the linen and then pressed the edges under for a pocket. Pinned and stitched that to the bag. So there. Done. Ready for more peaches and plums tomorrow at the farmer's market! 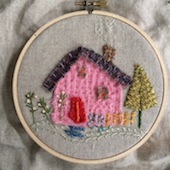 When I was at the beach in July and stitching every day, I designed and finished up this little cottage in a garden. Loved it so much that I had it printed on fabric for you to try too. Just put it into your hoop and start pulling from your bag of threads. Doesn't take very long to work and would be sweet on a pillow, towel or canvas tote. The design measures 5 x 7", printed on 100% cotton and pre-washed (to get the factory sizing out). Available in my Etsy shop now. One day last week, Mom's caregiver, Larisa and I took Mom to the city on the train. I've driven her in, but the train experience seemed a little daunting. We had all talked about it for awhile, always planning, never doing. But now that she's feeling so well, it was time. What a good idea! The Hudson Line is a spectacular ride itself on any kind of weather day. Even if we just had lunch in the station, changed tracks and rode home again, it's not a bad way to fill an afternoon. Grand Central is full of energy, excitement, food and shopping. Right outside the door is 42nd Street with the somewhat slower pace of August. Bryant Park is just a few blocks west. Where they were having a mid-day Broadway Showcase. We arrived in time to hear the last of West Side Story, a family favorite! Really! ... lunch under an umbrella at the Bryant Park Cafe. Quick visit to H&M where the current trends are very Grammy right now! (She snagged another cheetah tote and a new favorite cocktail ring for $5.) Her kind of fun, for sure. Gelato and people watching before the train home. If we sketched it out beforehand moment to moment, it couldn't have been better. It was so easy, so good for all of us, really. And she hasn't quit talking about it. Next time, we're going uptown to Rockefeller Center. Or maybe to the Met. We did it! High five! Home and refreshed after a quick weekend getaway with old friends. We had so much fun just relaxing on a slow, easy pace. Home-cooking, thrifting, catching up. I took my camera but didn't manage to take it out of my bag much. Sort of forgot about it. Yesterday in the Times, there was an article about a group of neuroscientists hiking deep into the un-serviced wilderness where they paddled and camped while discussing the effects of an unplugged existence. Of course, we know what they discovered. It's good to get away. But it's always good to come home again too. One of the first things I unpacked yesterday is this beautiful afghan crocheted by my friend, Dede especially for Maggie and James and their new house. She entertained us for dinner over the weekend and presented me with this gift to bring back to them. Isn't that so sweet?! Here in my own wilderness of sorts, the tablescape of kits and other bits to ship is the project for the day. Thank you for the orders! I love that kind of catch-up. My site has moved! Please read this post on my beautiful new site: www.housewrenstudio.com! A few years ago I taught a class at Tinsel Trading and we made Halloween houses out of oatmeal boxes. This turret shape is perfect for a spooky house- and also works pretty well for a cottage for a fairy or a doll or small things to stash. Place the oatmeal box on a tagboard scrap and trace around the bottom. Use pinkers to cut out a circle base slightly larger. 3/4 to 1 inch. This will be the glittery yard. Glue the container to the base and set aside. From a 12 x 12" patterned piece of scrapbook paper (heavier cardstock weight works best), use a plate for a template and cut a large circle. Identify the center of the circle with a pencil dot. Cut one straight line to the center from a point on the outside edge (as if you were cutting pie). Overlap the cut edges to form a rolled cone. Use a piece of tape on the inside to hold shut just long enough to try it on your container as a roof. Adjust for fit and trim as needed at the bottom edge. Then glue the cone shape shut where the paper overlaps. Set this roof cone aside. Finish decorating the house with flowers added on and glitter or whatever you prefer in the yard. I use reindeer moss for shrubs, tiny flowers and junk that is just here in the studio. O, and I put a little chalk coloring around the doors and windows to highlight the openings. For the roof, I wrapped some tinsel yarn around a spray of leaves and added some ribbon streamers. When you are ready, just drop the roof onto the turret house. You can put things inside too. Notes, coins, toys, candy, crafting bits. Or buttons! Wouldn't it be a cute gift box too? A smaller version from a paper cup would be a darling placecard/favor box. Or what about making a string or ribbon keeper with the string coming out through an opening in back? For my real life Summer Friday, I'm taking off for a weekend to visit old friends in Oak Park across the street from our old house, the one with the turret. See you back here early next week.